On the last weekend of August I made another trip to the White River Hills of north-central Arkansas in a last gasp effort to confirm the occurrence in the area of the swift tiger beetle (Cylindera celeripes). Records of this species include a single individual collected in 1996 at a site near Calico Rock, but two trips to the area this past June had already failed to reveal its presence. I didn’t really expect that I would find it this time either, and such was the case. However, what I was expecting/hoping to see was the beginning of the fall emergence of the prairie tiger beetle. 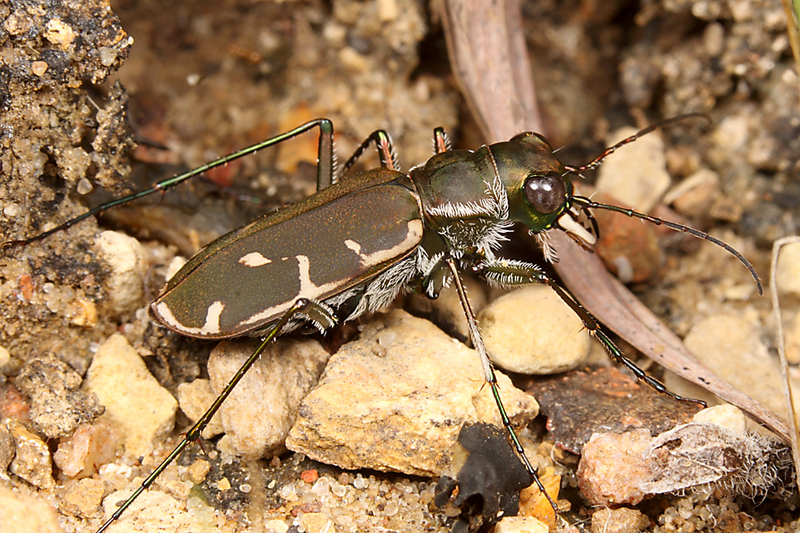 The Missouri/Arkansas disjunct population of this handsome species is perhaps my favorite tiger beetle of all, not only because of its good looks but because of the many spectacular fall collecting trips I’ve taken through the White River Hills to look for it. In this regard I had success, although only two individuals were seen all day long. The area around Calico Rock seemed dry, apparently having been missed by the thunderstorms that rolled through the area a week earlier and that would have surely triggered full bore adult emergence. 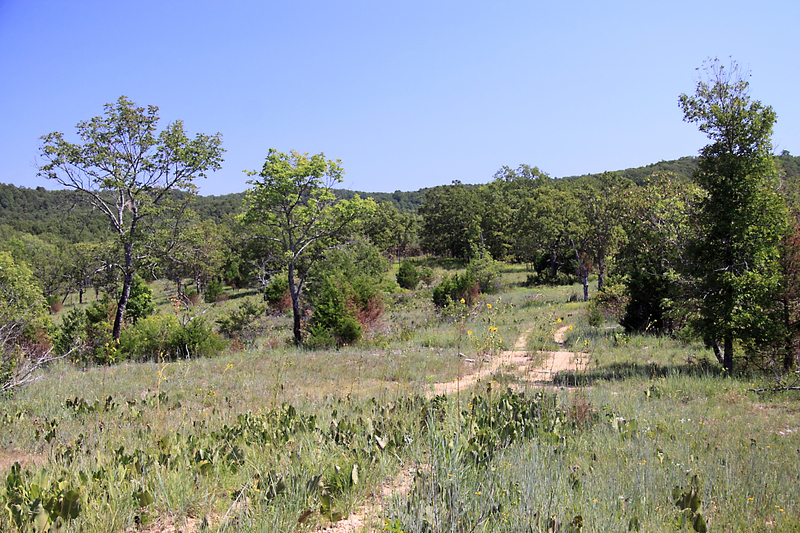 The following day I returned to Caney Mountain Conservation Area on the Missouri side, where last fall I had finally found prairie tiger beetles after years of searching what must be the extreme northeasternmost limit of its distribution. Fresh evidence of recent rains was seen, and accordingly the beetles were out in fairly decent numbers in the same area where I found them last fall. I took the opportunity to photograph a few individuals (which I had not done last year) and then turned my attention to looking for other insects. I had my eye out for the spectacularly beautiful bumelia borer (Plinthocoelium suaveolens) and eventually found one. I hoped also to see the marvelously monstrous Microstylum morosum (North America’s largest robber fly), which I found at this site in 2009 as a new state record and was rewarded with two individuals (these will serve as vouchers for the state record, since I didn’t collect it in 2009). Temperatures were rather warm and both of these latter species are traditional “summer” species; however, the presence of prairie tiger beetles, the tawny tinge to the prairie grasses, and the noticeably longer shadows under a deep blue sky told me that fall was, indeed, on the way. While prairie tiger beetles are (at least for me) the most iconic harbinger of fall in the White River Hills, another classic fall sight was the thick stands of prairie dock plants with their tall, bolting flower spikes. 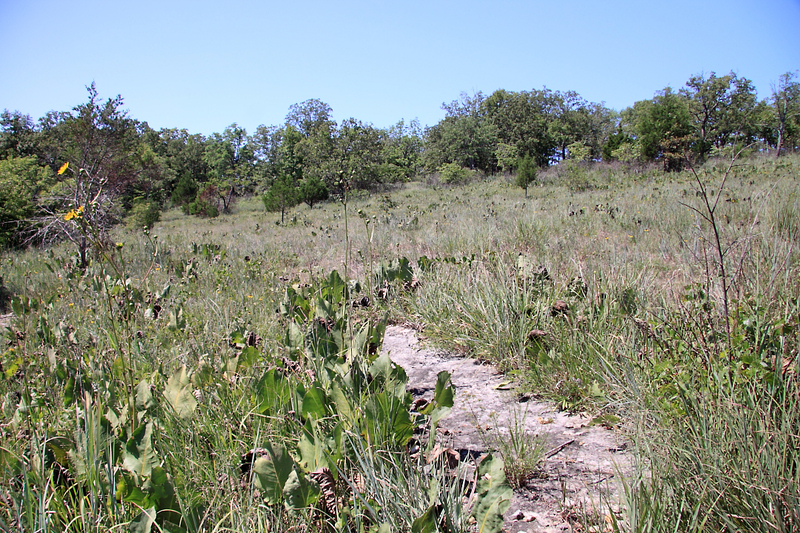 In Missouri this plant serves as a larval host for the longhorned beetle Ataxia hubbardi. In my early years of collecting in Missouri’s glades, I delighted in finding adults of these beetles clinging to the flower stalks during fall—presumably laying eggs from which larvae would hatch and bore down into the tap-root. Although commonly regarded as a pest in sunflower in the southern Great Plains, individuals associated with prairie dock in Missouri’s glades seem different—smaller, narrower, and darker—than those found on sunflower and other more common hosts. Additional material will be needed to make a final assessment on whether these individuals represent a distinct taxon; however, I have not been able to find this species on prairie dock in Missouri since I moved back to the state nearly 16 years ago. The reason for this sudden disappearance remains a mystery, and perhaps it is purely coincidental that the Missouri Department of Conservation began managing all of their glades with prescribed burns during my previous 5-year absence from the state. In the meantime, I will continue to examine prairie dock stems every fall in the hopes that once again I will find the beetles and be able to come to a decision about their taxonomic status. Perhaps I should re-focus my efforts in “low quality” (i.e., never-burned) gladey roadsides rather than our state’s “high quality” (i.e., high floral diversity) natural areas. 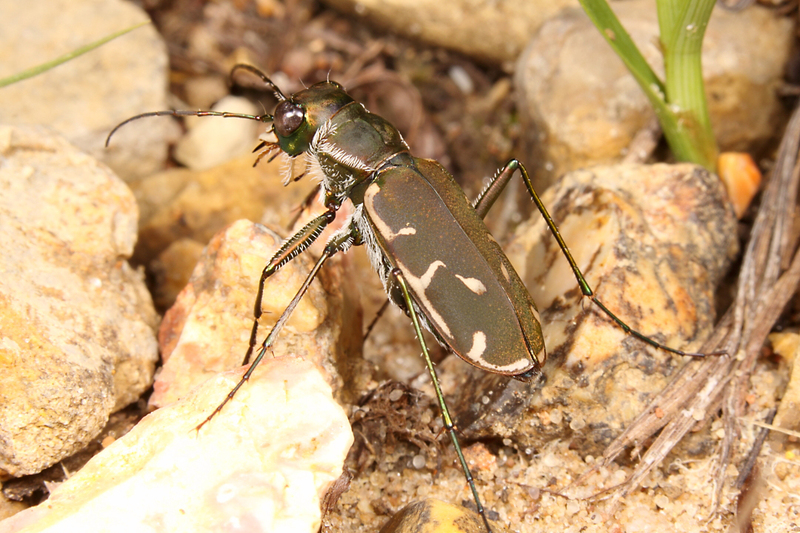 This entry was posted in Cicindelidae and tagged beetles, entomology, glades, insects, landscapes, longhorned beetles, Missouri, nature, Ozarks, science, taxonomy, tiger beetles. Bookmark the permalink. Seeing the browned lower parts of the cedars in your pictures, I wondered if you were going to say something about fire. It would be interesting to know if some of the often largish roadside populations of prairie dock still harbor your beetle. I’ve not spent much time searching for the beetle along roadsides stands of prairie dock, but it seems maybe I should. When I was collecting them in the 1980s they were reliable in the glades around St. Louis every fall. I can’t tell you how many prairie dock stems I’ve looked at since coming back and found nary a one. What is the prescribed burn regime for the managed glades? Do they burn the entire habitat? How frequently? I believe the larger parcels are divvied up and burned in 3-5 year rotations. Dividing smaller parcels is more difficult, so they tend to just get torched in their entirety and then every 3-5 years after. I’ve voiced concerns about fire impacts on insects in our glade and prairie natural areas on numerous occasions and have the impression that the folks in our conservation agencies (Missouri Dept. Conservation, Missouri Dept. Natural Resources, USDA Forest Service, etc.) now dismiss me as just another “anti-fire kook” (not true) – I fear I’ve probably lost any chance of getting to work for one of these agencies at some point in the future (which I would dearly love to do). However, the fact is for every study they cite claiming no or short-lived impacts on invertebrates, I can provide one demonstrating clear and long-term impacts – it’s all in the implementation. In my opinion, most of the studies claiming few or no impacts are compromised in their design to some degree – most commonly in the use of study parcels that are larger and not as disjunct as those we have in Missouri and/or focusing on insect taxa that are highly vagile and, while perhaps being prairie specialists, are not really all that rare to begin with. I’ve been collecting insects in Missouri for nearly 3 decades, and I have seen time and time again that when fire management is introduced to an area, the insect collecting tanks. The habitats may be gorgeous and floristically diverse, but there just… aren’t… any… insects!!! A prblem I’ve noticed in the fire impact studies is the use of species richness as the measure of impact. I would say it is not quite the case that burned habitats have no insects – Often they have plenty. But at the species list, and even genus and family levels, the composition is different. I’m perhaps myopic in my tendency to use the words “insects” and “beetles” interchangeably. In that same vein, increasing richness of springtails or aphids doesn’t mean much to me if it comes at the cost of the beetles that I’m most interested in. Maybe they should try to leave a portion unburned so that insects can move back in from the unburned area as would occur in nature. There is evidence that permanently unburned refugia could be valuable in reducing impacts on burn sensitive insect species. However, many of the pro-burners aren’t buying it and argue against such refugia because of concerns about woody encroachment and declines in floral diversity. The burden of proof should be on them, with discretion dictating a more conservative approach in the absence of such. Sadly this is not the case. Went up on “my” glade today, hoping to find a Tiger or two; however, I’m such a rookie that I didn’t really know how to look for them. While I was there, I baited and set two dung beetle traps. Now that the cooler weather is approaching, and the odes and butterflies will soon be leaving, I guess I’ll have to concentrate on beetles for awhile. Be prepared for LOTS of Coleopterean Inquiries in the next few months.